SPACE.com reader Andrew Steel of Hot Air Balloon Cairns in Australia sent in this photo of sun's full corona during the eclipse taken from a hot air balloon on Nov. 13, 2012 (EST). Students will send 57 cameras up by weather balloon to monitor the 2017 total solar eclipse on Aug. 21, and the near-space views will be livestreamed from coast to coast in a collaboration with NASA. For the initiative, called the Eclipse Ballooning Project, teams from universities across the United States will fly the balloons as high as 100,000 feet (30,000 meters), and the views they send back will be collected and broadcast live on NASA TV, as well as on local and national TV stations, with the help of the online video platform Stream. You will also be able to watch the broadcast right here on Space.com. "We have spent the last three years researching and building the camera payloads and ground stations in preparation for eclipse day," Angela Des Jardins, director of the Montana Space Grant Consortium and leader of the Eclipse Ballooning Project, said in a statement. "The live-video distribution was the last technical hurdle we needed to overcome, and the partnership with Stream allows us to focus on the payload technology while they handle the video." NASA expects the eclipse to be its most-viewed live event to date, according to Stream's statement, topping the number of views for the landing of NASA's Mars Curiosity rover in 2012, which garnered more than 100 million unique viewers. In addition to the balloon views, NASA's "MegaCast" will feature interviews with scientists who are studying the eclipse. 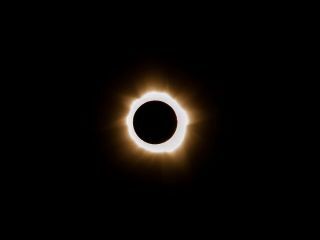 The most recent solar eclipse to be visible in the continental United States at totality — that is, when the sun is completely covered by the moon — occurred in 1979, and only a few states in the northern part of the country got to view the total solar eclipse, rather than just a partial eclipse. A total solar eclipse hasn't crossed the United States all the way from coast to coast since 1918. Now, technology will let viewers who only get partial eclipse views, or none at all, experience totality from high above the Earth. Remember, if you watch the eclipse in person, you MUST use proper eye protection, such as solar eclipse glasses, until the sun is fully obscured by the moon. If you're in an area with only a partial eclipse, you'll need it the whole time.